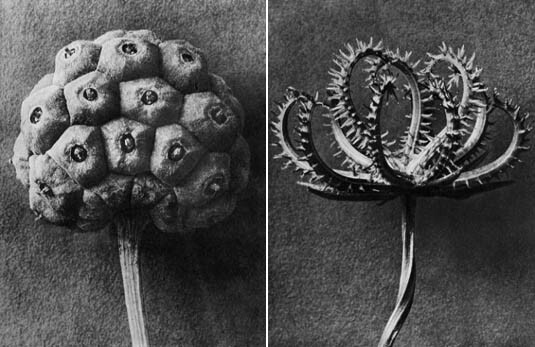 [Images: Botanical photogravures by Karl Blossfeldt]. I've been going through a lot of old files and papers recently, and I thus found a short piece I clipped from New Scientist five years ago. I absolutely love stories like this, and I swoon a little bit when I read them; it turns out that "plants growing over old sites of human habitation have a different chemistry from their neighbors, and these differences can reveal the location of buried ruins." The brief article goes on to tell the story of two archaeologists, who, in collecting plants in Greenland, made the chemical discovery: "Some of their samples were unusually rich in nitrogen-15, and subsequent digs revealed that these plants had been growing above long-abandoned Norse farmsteads." The idea that your garden could be more like an indicator landscape for lost archaeological sites—that, below the flowers, informing their very chemistry, perhaps even subtly altering their shapes and colors, are the traces of abandoned architecture—is absolutely unbelievable. [Images: More extraordinary photogravures by Karl Blossfeldt]. So why not develop a new type of flower in some gene lab somewhere, a designed species that reacts spectacularly to the elevated presence of nitrogen-15 from ruined settlements? Ruin Flowers® by Monsanto acting as deserted medieval village detection-landscapes, as thale cress does for mines. You plant these flowers or trees or vineyards—future archaeological wine—and you wait three seasons for the traces to develop. Now imagine a modified tree that can only grow directly above ruined houses. Imagine an entire forest of these trees, curling and knurled to form floorplans, shaping out streets and alleyways, rooms instead of orchards and halls instead of groves. Now imagine the city beneath that forest becoming visible as the woods slowly spread, articulating whole lost neighborhoods over time. 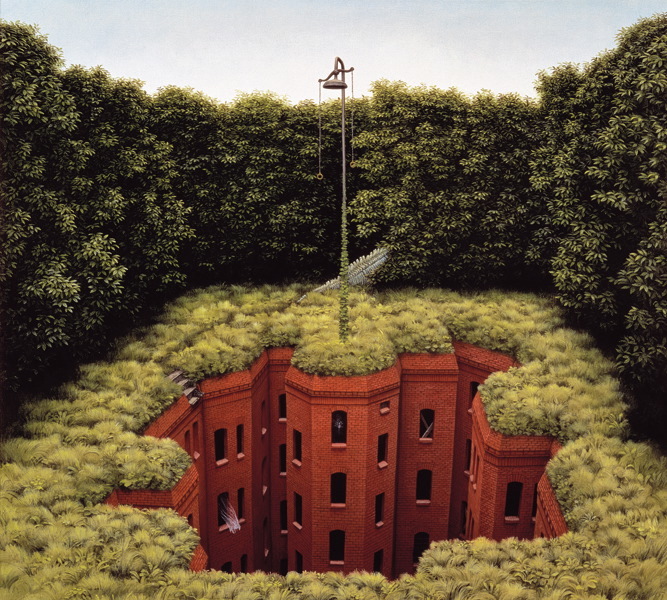 [Image: Summer in a city by Jacek Yerka]. Genetically-modified plantlife used as non-invasive archaeological research tools would, at the very least, add a strange practicality to summer gardening activities, in the process turning whole surface landscapes into an unexpected new kind of data visualization program. It's the earth's surface as browser for what waits undetected below. (Blossfeldt images found via but does it float). On a similar note when walking in the eastern woodlands, among other places, if you see a fruit tree, such as apple or pear, etc., it is a sign of an old home site. The buildings are long dissolved back to the elements but the trees and possibly their descendants are still there. Reminds me of RedDetect, the flower that was being 'designed' to detect landmines below them by flowering red. I think the project has been scrapped, but could be useful for tracking pollution, underground resources, etc. Living plants as tools, not just production machines. To bring it to an extreme; every plant and animal could be an edible sensor, warning us of danger, or opportunity. Perhaps not everything should be so engineered, or human serving. You don't need isotopes, just look for crop marks (plants grow differently based on what's under them- leaving positive and negative crop marks), which archeologist have been doing for years, especially in aerial survey. great piece as usual, although as an archaeologist i'll reiterate the point that surface surveys based on aerial photographies, geophysics and other non-intrusive means are common in archaeology. also any archaeologist will cringe when they hear 'non intrusive' and 'plants' spoken in the same breath! Root action are one of the most devastating taphonomic processes -- make sure you tell Monsanto to make these plants light on the root systems. I went in for the 'like' button...too much facebook...not enough BLDGBLOGDNG..i assume thats the operative verb? And of course the plants can give away a lot more than just ruins. See this story about aerial reconnaissance during WWI and the flower beds that revealed German bases. This story reminds me of the set of images in your previous article "infra". The information that plant life can be provide about the state of our physical surroundings is trully incredible. Wow, this is very interesting, an intellectual concept I will have to ponder. I'm generally turned off by genetically-modified anything, yet this intrigues me. ilexcassine and the archaeologist beat me to it. I love flying in Europe, as you approach the airports, you can see all sorts of shapes in the wheat fields. Sometimes, it's just an old stream, plowed over and made flat, but the water still flows below. Other times, I've seen definite roads, and I always wondered if they're 200 or 2000 years old. To Ches's point, that works especially well in Hawaii, where for hundreds of years, natives planted useful trees (bamboo, kukui/candlenut, and ti) around their habitation sites. The neat part is that you can recognize some of these, especially kukui's light foliage, on Google satellite view, and thus guesstimate where settlements were. On the ground, ti was almost always associated with habitations, and it doesn't propagate naturally, though roots will sprout and survive for hundreds of years. Instant homesite (or other important site) identification. Thanks for all the comments! I've written a little bit previously about plants and aerial archaeology, and I hope that a forthcoming interview, to be posted here sometime early next year, will delve into the subject in much more detail. Such a beautiful concept. Biomimicry on a certain level. The red flowers responding to landmines is fascinating! Reminds of my of Invisible Cities by Calvino. Great short read, definitely inspiring! Biogeochemistry has the potential to provide a non-invasive method of mineral exploration. By collecting leaves from living red river gums and analysing them for trace elements, scientists at the University of Adelaide identified the presence of silver deposits near Broken Hill, without disturbing the topsoil.